Friedrichshafen 19.10.2017. During the Supplier Conference 2017, Mr. Dr.-Ing. 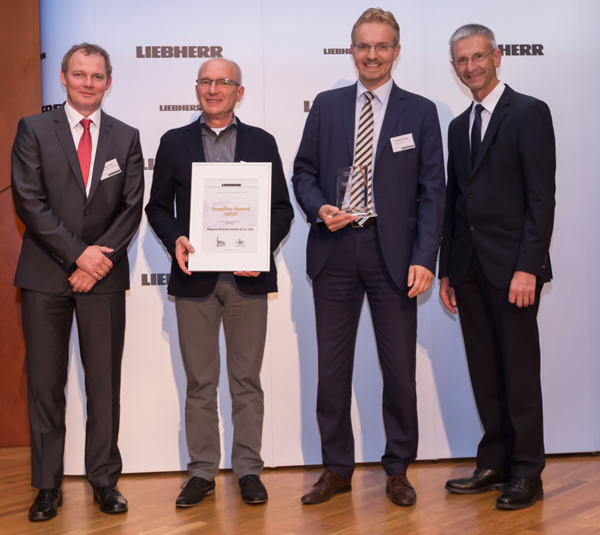 Albert W. Schultz and Claus Peter Hasel were presented with the Supplier Award 2017 from company Liebherr Aerospace Lindenberg GmbH for “excellent performance” relating to long-term quality and delivery reliability. The management thanked company Liebherr Aerospace for the award and also all MSM employees, who contribute to the success of this important business relationship. 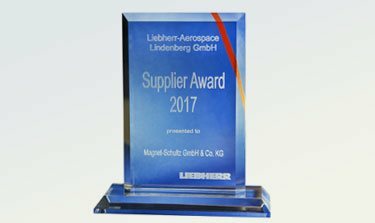 For Magnet-Schultz this award from Liebherr-Aerospace is the first in the aviation sector. Together with the awards of companies Robert Bosch GmbH (2x), Festo (2x), ZF and Fiat Chrysler Automobiles, this is the 7th customer award for MSM.